As a white-collar worker in 1990s, I stayed in Taiwan and assisted a foreign company in market expansion for three years. It was a time when Taipei Metro began operate and when there was no party alternation in Taiwan. I lived in Xinyi-Special District and worked on Nanjing East Road. I was unfamiliar with the west of Taipei because my basic activities took place in the east of Taipei. I only visited Lungshan Temple of Manka and Raohe Street once or twice, but never went to the south of Wanhua District. 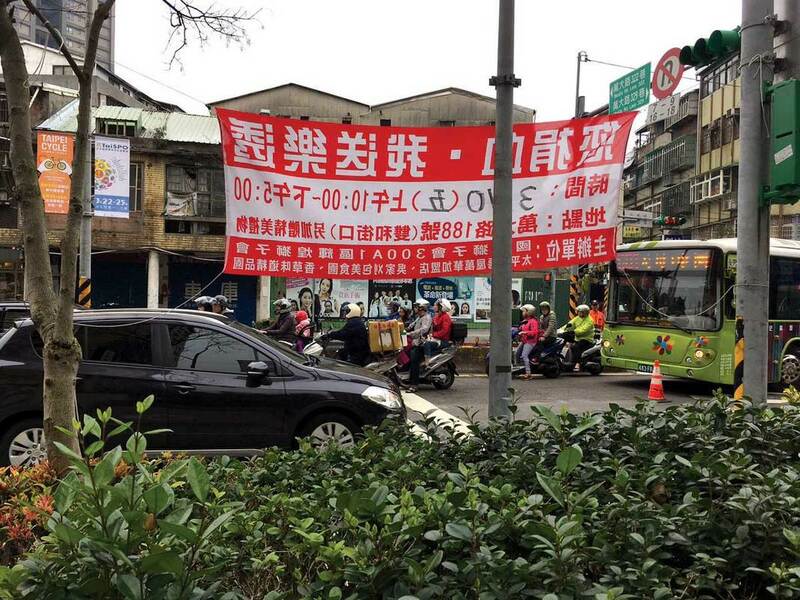 During this era of economic boom, the Eslite Bookstore started to sell its share in the stock market, the market of telecommunication opened, Taiwan’s information-technology industry became an important player in the global market, especially in the development and production of wafer and chip. The style of Taiwanese business was known as “fast, resolute and accurate”, which was the key to being one of the Asian Tigers. Hongkongers look upon twenty years after in 2017. 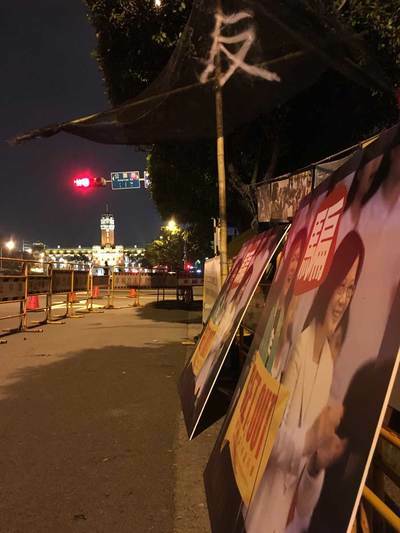 It is her democracy, humanity, agriculture, and slower lifestyle that Hongkongers envy very much nowadays. Invited by Art Together, I joined the artist-in-residency program in Waley Art in Taipei for a month. With this different role, I was expecting to experience a different side of Taiwan. Revisiting the same sites, I see that the 153 hectare Xinyi district has been developed, Taoyuan Airport MRT is in operation, and Taipei metro has extended to New Taipei City with five metro lines already. However, the south Wanhua District, where I resided in, has stuck in the scenery of 40 years ago. The old district begun to develop in 1960-70s. Hence, the view, architectures, smell and living style in this district reminds me of my childhood in Fung Wong New Village, Wong Tai Sin, Hong Kong. The cozy neighborhood persists well here, because south Wanhua District has not been covered by metro yet. 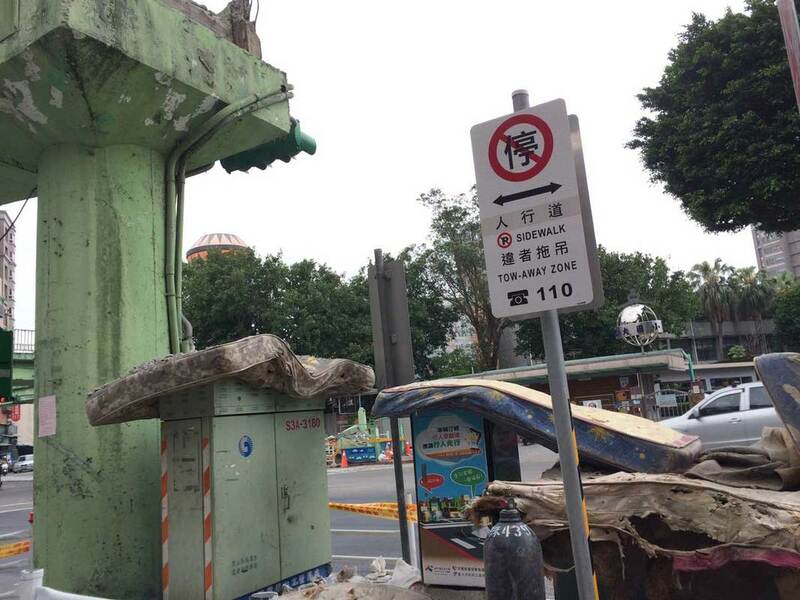 However, there are still hints of the metro’s arrival, for example, the 20-story grand residence estate surrounded by the low-rise buildings, the trees removed from the streets, and the forbidden pastel green footbridge across the trunk road. Bit by bit, this old district is entering the beginning of the urban renewal. 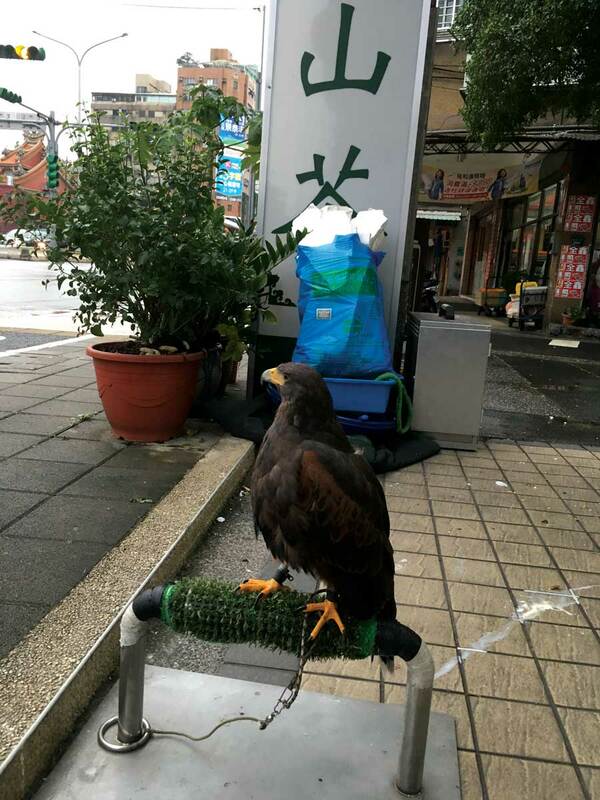 Outside of a store near Wanhua Station, there was a about 10-inch tall hawk standing on the metal parapet over the sidewalk. It was being locked and linked with a 20-foot long rope to the parapet. Near the primary school in Wanhau District, the pastel green footbridge built in 1960s was being demolished. Under the bridge, there were old beddings in different colors and sizes to protect the ground from the falling debris. 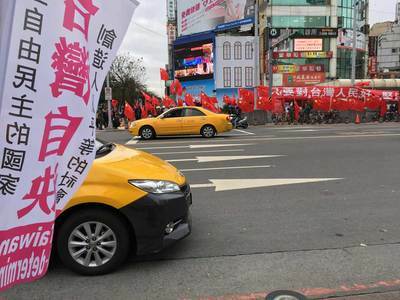 The red and white banner was attached on the trees on Dechang Street. “You donate blood. I give you lottery” was written on the banner towards the street. Living without a cage, the big bird seems to be free until it wants to fly for real… Is this owner’s wisdom? Beddings, supposed to be indoor for people to rest on, are now moved to open space to protect the ground… Is this the smart cost reduction scheme of the contractor? Blood donation, which should be the act of selfless devotion, is now connected with an opportunity to be rewarded in the lottery… Is this the organizer’s stratetic publicity plan? Are these lies? Or merely embellishments? On the street that will face rapid changes, I can see the self-absorbed language in this paradox, and start to understand that artist-in-residency is a learning process of study through living out there. In the middle of March, I followed Taiwanese artist friends to visit Ketagalan Boulevard. 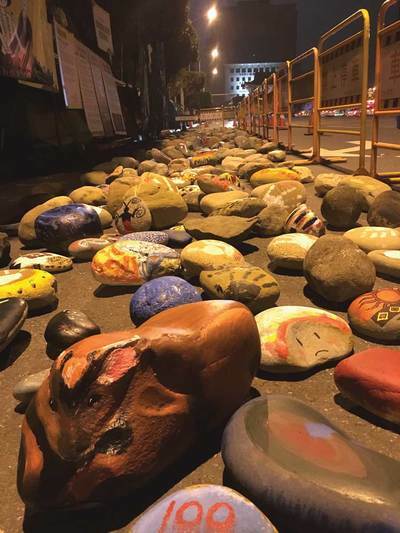 There was the temporary community of Puyuma people, one of the indigenous groups of Taiwanese aborigines in front of the President’s office, rather than the protest hosted by Pan-Blue groups or Pan-Green groups. They were here to fight against newly approved constitutional article that excludes any private land from being designated as the indigenous territory. The controversy lies in the fact that is article allows development plans on the indigenous territory not to “consult and obtain consent by indigenous peoples or tribes” at all. Indigenous groups’ rights would be damaged. For example, they will lose area for hunting area that has been their tradition for thousand years. How can they proceed with their lifestyle without hunting area? The scene on Ketagalan Boulevard seemed to imply a very long-lasting oppression suffered by the people. Since the inauguration of TSAI Ing-Wen as the president in May last year, Taiwan has faced more diplomatic oppression by China. At the very beginning, indigenous groups, who had been suppressed for a long time, stood for TSAI Ing-Wen in the president campaign. However, now they feel being betrayed by TSAI. Instead of yelling or expressing themselves through violent actions, they taught passers-by Pinuyumayan, sang their folk songs, and shared stories about their families everyday at the protest site. Besides, they exhibited hundreds of big rocks from their homeland in response to land titles explained by the legal document. (The diameter of some rocks was one foot long) Participants can learn the indigenous art and drew on the rocks placed on Ketagalan Boulevard. It reminded me another scene I saw in the previous weekend. There was a sea of two different flags, written “Self-determination for Taiwan” and “Just be nice to Taiwanese”, outside of Ximen metro station. Compared with the scene on Ketagalan Boulevard, indigenous peoples’ expression was a soft sell. Art becomes the outlet when the suppressed one faces the virtual impossibility. Through arts and performance, audience can understand their feelings. Such an indirect and soft medium for expression turns out to be an effective education tool. At least, the rocks moved me. The visual language of the rock installation reminded me that Eskimo language has around fifty words to describe “snow”. At a moment, the visual power transcended any spoken language. Questions about different levels and layers of the ideas of “Localism” and “Particularism” came to my mind during this visit of the indigenous group. After leaving Ketagalan Boulevard, I still kept searching more and more about their status and history. I believed that the purpose of Art Together bringing art to public place outside the white cubes is also about encouraging audience to reflect upon various current issues within a specific context. In late March, I visited to Soulangh Cultural Park in Tainan for the exhibition “Kau-Pue, Mutual Companionship in Near Future”. I found that Walking Grass Agriculture and curator of Waley Art all have closely studied the cultural elements of temples, worship and other rituals in festive celebrations. Growing up in Hong Kong, I personally am not familiar with these aspects. Through visiting this exhibit, I hoped to acquire more knowledge of such. “Kau-Pue” literally means getting together or communicating in Taiwanese. “Kau-Pue Realm” is the organization of the folk temples since Qing dynasty. Chief curator GONG Jow Jiun led his curatorial team, together with 38 local and overseas artists to work on the idea of “Kau-Pue Realm” at the Soulangh Cultural Park, which was Meiji Sugar Corporation‘s first modern sugar refinery. Artists have explored the tradition and culture of temples in different media. Some of these were impressive documental works, for example, LIN Bo-Liang represented the essence of temples, YAO Jui-Chung discussed the relationship between religion and society, SHEN Chao-Liang used the moving stage for the solemn occasion in Taiwan, and CHEN Po-I recorded the spirit of Taiwan populace when praying. Although I was not familiar with these, I learnt much more about the society and culture of Taiwan (especially Tainan) and Walking Grass Agriculture in this exhibition in a short period of time. In this exhibition, HSU Chia-Wei’s video installation “Spirit-Writing” documents his own “Kau-Pue” experience with the god Marshal Tie Jia, born 1400 years ago in China’s Jiangxi Province, with the help of villagers from the Matsu Divination Chair Association. HSU invited Marshal Tie Jia through the divination chair ritual, which is practiced by the villagers to make decisions about many matters in life. He followed the god’s instructions to construct a 3D temple to worship the god. The artist also transformed the motion throughout the ritual to be a 3D animation. There were three layers of “Kau-Pue Realm” in HSU’s artwork: folk art, cultural practice and technology. In the countryside of Tainan, I watched these surreal “Kau-Pue” scenes (the country of gods and the world simulated by computer) and realized such a dialogue can be developed by contemporary art. Through the artists’ transformation, awkward situations can be represented in different contexts, and, therefore, help provide more possible language to describe and read the world. After the visit, I went back to Taipei and started to prepare my artist-in-residence exhibition in Waley Art. Starting from the corner of the room I stayed at, I used the 70s stockings and the debris of footbridge on Wanda Road to reconstruct the work across third to fourth floor. Through the artwork, I responded to the previous exhibition took place in the same space. Vivian FUNG is a Hong Kong-based artist and curator graduated at Macquarie University with majors in Psychology and Sociology in 1992. After working for the business sector, she went back to university and received a master degree of Visual Arts at Hong Kong Baptist University in 2016. Her artworks, often involving found objects that are dated, enquire about the essence of strength and humanity. She also attempts to curate It was the first time she joined a residency program.